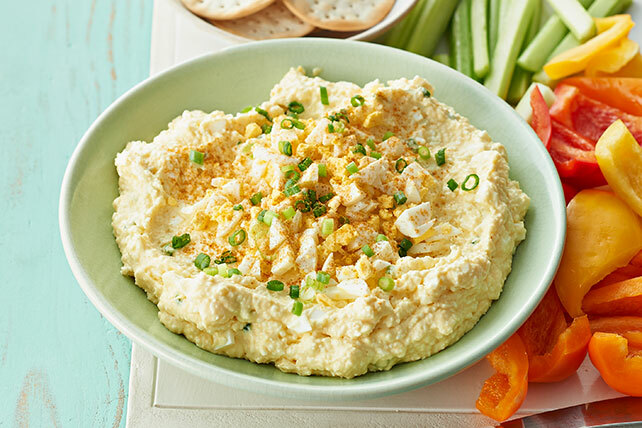 Enjoy a delicious Deviled Egg Spread for your favorite appetizer dippers. Try this unique twist on a classic starter at Easter or your next event. Reserve 1 egg for garnish. Cut remaining eggs lengthwise in half. Remove yolks; place in food processor. Add mayo, Neufchatel, vinegar, mustard and 12 egg white halves; process until blended. Spoon into medium bowl. Chop remaining egg white halves coarsely. Add to Neufchatel mixture with 2/3 of the onions; mix lightly. Chop reserved egg finely; sprinkle over egg mixture in bowl along with remaining onions. Garnish with paprika. Serve with assorted cut-up fresh vegetables and crackers.